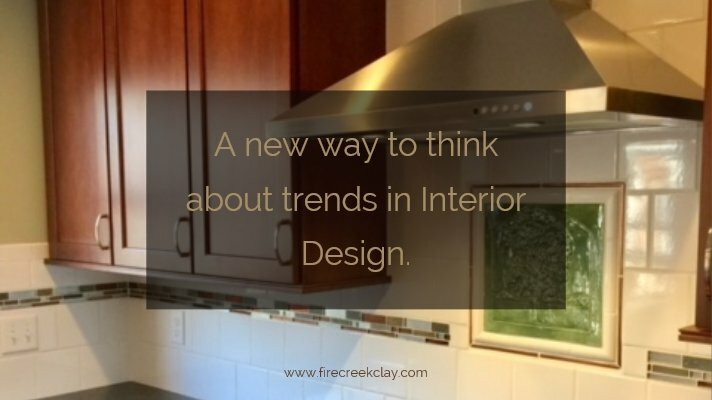 A New Way to Think About the Trends in Interior Design. Hey! Won’t handmade tile get outdated quickly? I was asked this very question not too long ago and it’s a good question. And I have a great answer! The word TREND is a noun meaning “a general direction in which something is developing or changing”. Thank you, SIRI….and trends are just that…fashionable designs that change from either season to season, year to year or on a larger scale even every decade. All fashions change…yup, even everyone’s favorite trend of the moment…Farmhouse and Shiplap is a trend and will be popular for a few years until something else takes its place. There is a reason that remodeling is BIG business. If you buy stuff you love, regardless of era or price, your home will be a true reflection of you. ~Sarah Norwood. I love this quote. I truly believe that if you buy things that you love, your home will never be out of style. Our homes should give us solace, a shelter in the storm. The dwelling that we make as a home for our family should reflect our personality. We should surround ourselves with things that we love, that holds memories and evokes a sense of peace and security. Let’s live among things that make us happy, whether that be handmade tile, a sequin pillow, or perhaps that sea turtle sculpture you picked up on your first trip to Hawaii. We should live among things that brings us peace and refreshes our soul, not what happens to be trending at the moment. Fire Creek’s Mission is to help you create the look of your dreams. Here at Fire Creek Clay, we live this mantra. Fire Creek exists to create unique ceramic tile for your tile project to give you the meaningful design you are dreaming of. We recently created beautiful hand carved Oak Tree tile for a client. Every day, this tile will remind her of one that she had picked out with her mother years before. We have crafted sweet little pygmy goat tiles for a client who raises and shows them for a living. Fire Creek carved several different Loon tiles for a client raised in Minnesota and has fond memories of these beautiful birds during his childhood. Fire Creek treasures every one of these beautiful stories and it keeps us striving to continue our work. So, does handmade tile ever get outdated? I don’t think so. I believe it surpasses trends. It is only out of date when you are ready for something new. On your next tile project, take a look at handmade tile and see if anything catches your eye. It could be the first step to creating the meaningful home you have been dreaming of. The Infatuation with a Mountain.